Our ‘Enabling the Good Life’ report discovered that people desire “meaningful connections” with companies and brands. 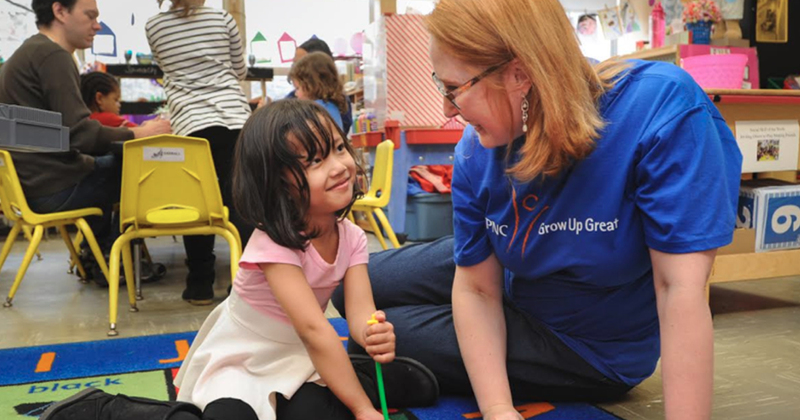 Through its social impact initiative, PNC Grow Up Great®, PNC has created positive change for an issue critical to our future economy and society: early childhood education. PNC Grow Up Great® is designed to help prepare children, from birth to age five, for success in school and life. The company delivers this long-term, $350 million bilingual initiative, through grants to national nonprofits and to local partners; awareness-building efforts; a robust volunteer program; and issue advocacy. The foundations for “the good life” begin in early childhood, a pivotal period for 85 percent of brain growth. Research suggests that by the time they are 3, disadvantaged children may hear 30 million fewer words than their more affluent peers, and unfortunately, more than two out of every five children live in low-income families. Quality early childhood education could percent. Communities benefit too, the long-term Perry Preschool study showed that every dollar invested in quality early childhood education can deliver back up to $16 to society. PNC Grow Up Great equips families with free, high-quality educational opportunities and resources. Online digital storybooks are available and more than three million multi-media educational kits have been distributed. Children are given hands-on experiences; visits from a Mobile Learning Adventure; the Sesame Street® Growing Up Great Together Under One Big Sky mobile planetarium; and “Be My Neighbor Days” with The Fred Rogers Company and local public television stations. Caretakers are given tips and tools to make daily experiences fun and educational. In addition, PNC has sparked new thinking and new behaviors by lending corporate assets to the messaging; using communications in-branch, at ATMs, online, in social media and traditional advertising. The program extends to PNC employees, allowing up to 40 hours of paid time off each year to volunteer and unites the company in an annual “Great Day” of service. To learn more about PNC Grow Up Great, click here.